Appraisal mentor Gus Agosto spoke to a packed room at the Casa Verde, Greenleaf Hotel, General Santos City seminar hosted by the local board of Philippine Association of Real Estate Board, Inc (PAREB-GenSaSAreb). His workshop and presentation on “Workshop on Valuation of Real Estate Properties,” focused on the how to’s in conducting real estate appraisal. The workshop highlights were the actual site inspection of properties in the city proper and reporting of the findings and the final value to a panel of experts. Senior Appraiser Art Lawa said “We have done an activity like this (workshop) in the past, but this one is much better and productive”. The workshop provided an actual appraisal assignment for the participants. They were divided into groups and provide an assignment to render an opinion of value to the properties. More than 80 real estate appraisers and brokers attended the workshop, which include bank appraisers, assessors and private practitioners in General Santos City, Cotabato and nearby provinces. The workshop received high marks from nearly everyone who attended, with the vast majority of attendees rating the event as one they would enthusiastically recommend to their colleagues. 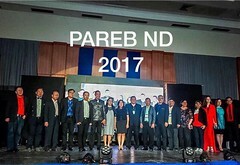 “We are thankful to real estate appraiser guru Gus Agosto for sharing his skills and knowledge to GenSaSareb members, “ PAREB National Director Nimfa Esguerra said. The workshop is part of the nationwide Appraisal mentoring program of PAREB. It provides support to appraiser-members to grow and become successful in their field. Mentoring program is designed to help new appraisers to gain actual experience and with the help of mentors from its pool of senior and experienced appraisers. PAREB President Rey Cartojano expresses its support to the seminar. “We should institutionalize the education for each licenses in real estate practice-real estate broker, appraiser and consultant”. This will be fully materialized with the establishment of PAREB Academy in the future. “Let us make PAREB not only as the oldest and biggest organization in the land, but also the most dynamic organization,” he ended.